Fluidtecq butterfly valves are preferred valves because they are 100% leak tight and operate smoothly without much effort. Standard: short wafer type (BS5155)end connection: wafer sandwiched. Size range: 40mm to 300mmpressure rating: pn16 operating temperature: 0 to 150 deg c seat leakage: tight shutoff operation: hand lever for sizes: 40 NB to 250 NB worm gear boxes, pneumatic, electric operation- optional. Standard moc: body: SG iron/WCB/CF8/CF8 MDISC: SG iron/WCB/CF8/CF8 mrubber sleeve: nitrile/epdm/neoprene/vitono-ring: nitrile/epdm/neoprene. 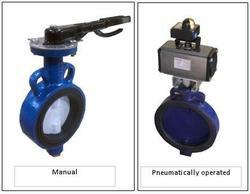 We offer Butterfly valves for industrial application. Prompt Deliveries and most competitive prices. Our advantage lies in the fact that most of the parts are manufactured in-house and hence dependency in terms of quality and delivery are minimized. Smooth operation and long life. Easily serviceable at customer end. 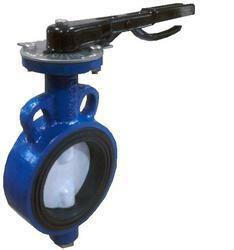 Butterfly valve can be mounted between flanges as per EN 1092, ASME/ANSI, JIS, BS-10. This general purpose soft seated Butterfly valve has a fully rubber lined single piece body with centric disc construction and is available in wafer type body pattern. Actuator Butterfly Valves offered find application in meeting up with the mechanical application needs in different industry sectors. 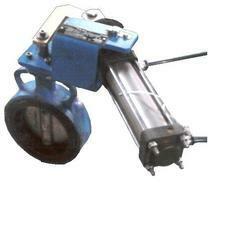 These are best applied in areas requiring regulated flow of fluids using a series of pipes. Other than this, the valves are also used in larger lines in form of front as well as rear suctions as well as in fire apparatus based applications. Here, our expertise lies in making available in different dimensions and specifications including in customized finish options as demanded from us.